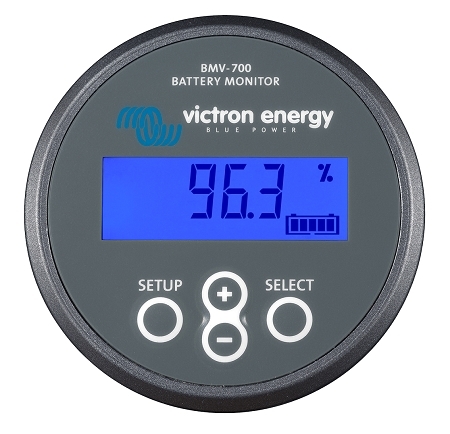 This Victron Battery Monitor keeps track of current flowing in and out of a battery bank and uses a sophisticated algorithm to read out the state of charge of the battery in Percentage Remaining and Amp Hours Remaining. It also displays Volts and Amps time to go, and Consumed Energy and keeps track of Historic Data including Battery Efficiency, Average Discharge, Deepest Discharge, Number of Cycles, Overvoltage, and Undervoltage Alarms. 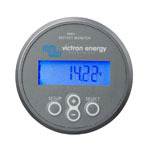 Victron Energy BMV 700 single bank amp hour meter and energy monitor Monitors volts, amps, amp hours and time to go for a single battery bank. 10 metre cable, connectors and fuse included. 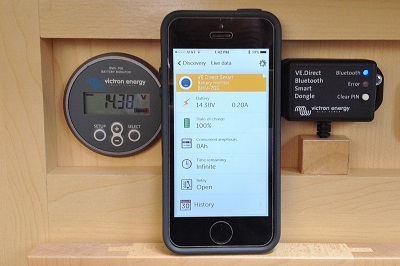 If you add the Victron Energy Bluetooth Dongle you can read the information on your iPhone or Android device wirelessly. 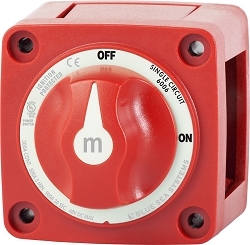 If you need to locate the shunt in an exposed place where it might get knocked I recommend the Blue Sea 2719 as a housing for the shunt. 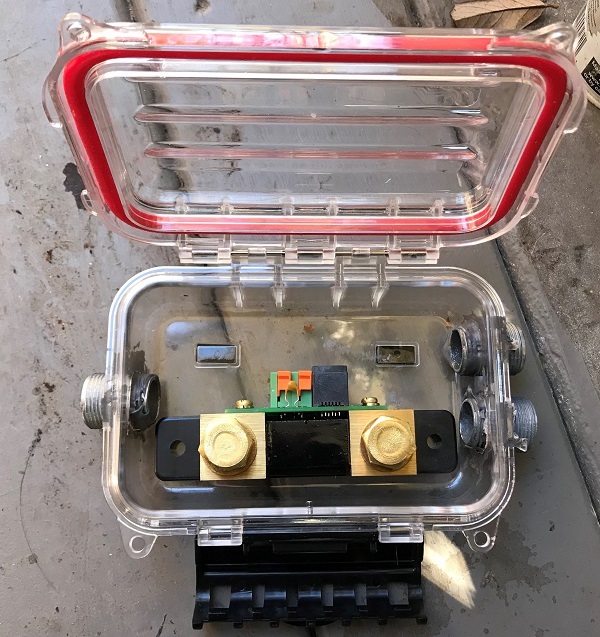 This is not a waterproof housing, if you want a waterproof housing you have to make your own but take a look at the one that comes with the BMV700H for suggestions on how to do that. Q: Can I use this on a back of batteries of 6 to tell me what % the bank has amp hrs left? A: Yes, that is what it if for, the batteries must be together in one bank. Q: WILL THIS WORK FOR A RV WITH 3 DEEP CYCLE MARINE BATTIERS? A: Yes this will work great provided the batteries are in a single bank. Q: I have a 6 battery 12 volt system. The batteries are of various ages and I do not use an inverter. Straight solar charge. Can I use this device on my system? A: Yes you can use it on this bank. Its never a good idea to mix batteries of different ages in one bank so it will be interesting to see what you learn after it has been running for a while. It collects historic data and can work out the efficiency of the batteries. It assumes an efficiency of 90% to start but over time it works out what the actual efficiency is. I normally recommend replacing batteries when they have got to 85% efficiency. At that time they still work and you mightn't notice but their time is very limited. If you get the Bluetooth Dongle you can look at all the data on your phone with minimal button pushing. Q: Can I extend the rj12 cable? If so how much? A: The absolute maximum is 60 meters, but I would advise something shorter, 50 or so. A: It was designed for use on boats. Its not waterproof though so it is for use in the dry part of boats ! Q: I have an older sailboat with two identical 85ah marine batteries connected to the boats electrical system with the traditional 1/2/off/both switch. I'm thinking of upgrading my electrical system, but wanted to start with a monitor for a season to get a good handle on my needs. I operate the system in "both" when the engine is running to facilitate charging. Under sail or at anchor, I select 1or2 to ensure I always have a fresh battery for starting. My questions are 1. Can your monitor give me information on both batteries individually? 2. If I'm monitoring one battery, will going to the "both" position mess up the data presented by the monitor. 3. If I went so far as to buy a monitor for each battery, would use of the "both" function ruin the information the monitors provide, and, furthermore, damage the monitors? A: Good question. 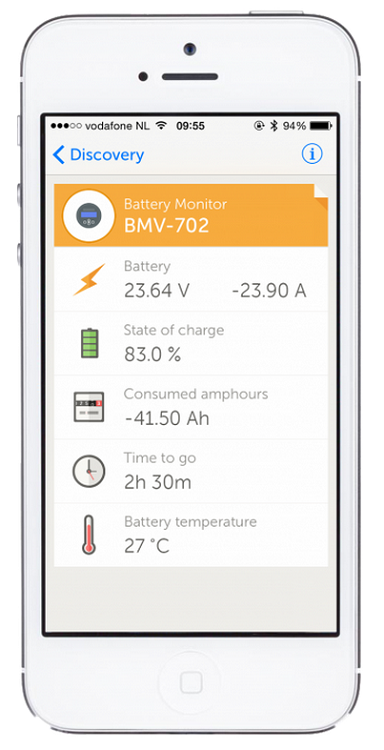 If you want to monitor both batteries individuality then you need to get two of the BMV700 meters. Then you need to install the shunts for the meters, which is what do the measuring, immediately after each battery, so that the batteries do not connect directly to each other but only through the shunts. The shunts go on the negative lines. Then it doesnt matter whether you have the switch on 1, 2 or both, each battery is being monitored separately. If you only wanted to do a half way approach you could get a BMV702 meter and use it on one battery only. It could measure the voltage only of the second battery. In this case you would put the shunt on the negative line of the battery to be measured and make sure the two battery negatives only connected to each other downstream of the shunt. Whichever method you choose dont forget that if you rewire the system or add more batteries at a later stage you need to do a factory reset on the meters to erase all the historical data since it wont be relevant in the new setup. Q: Does the meter come with all necessary wiring? How long is the wiring? I currently have a Xantrex link 10 that has failed. Can I use the Xantrex wiring? A: This comes with a 10 meter cable to go from the display to the shunt. Its a telephone cord with plugs either end. You cant use your old Xantrex twisted pair cable. 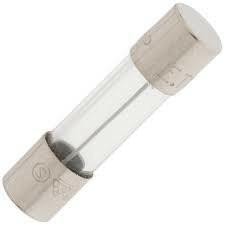 This also comes with a short wire with fuse to go from the shunt to the battery positive. 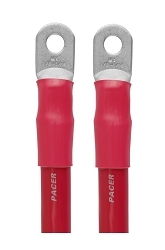 If you dont already have one you will need a battery cable to go from the battery to the shunt. Q: When used as an hour meter is it possible to show the actual running hours of the engine or does it count all the hours the key is turned on ? Q: I have 2 questions: - I have a battery disconnect switch that isolates the battery from all loads and all charging sources. I'd like to connect the BMV pos supply wire to the load side of the switch rather than directly to the battery terminal so that I can still use the switch to completely isolate the battery (if needed for any maintenance or repairs). Is there any problem with doing this? 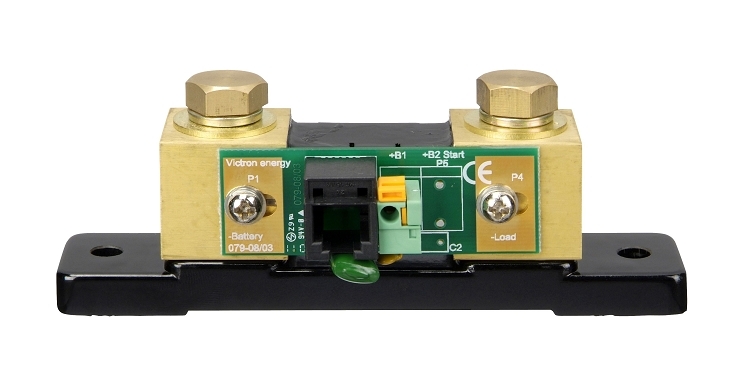 I realize there could be a slight voltage drop across the switch, but would that matter very much? - My batteries will be in a battery tray underneath my van. 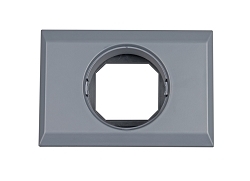 I'm thinking about mounting the shunt on the outside of the tray where it could be exposed to water, dust, and road debris. I doubt that the Blue Sea 2719 would provide enough protection in this location. Is there another box or component you'd recommend? A: The meter must be powered up all the time. 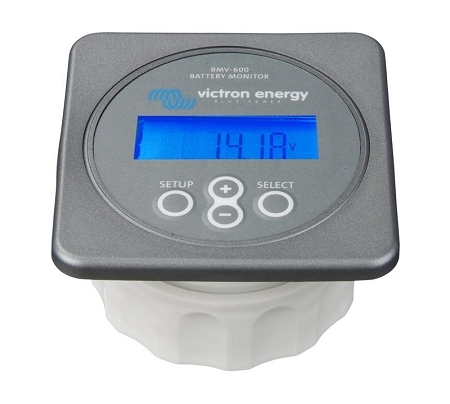 The Victron BMV power consumption with the backlight off is less than 4mA so that is not a factor. If you want to make a waterproof case for the shunt you are on your own. One of my customers made a very nice one using a transparent Pelican case that was designed for taking valuables in a dinghy or to the beach. If you want further inspiration take a look at the high voltage version of the BMV700. 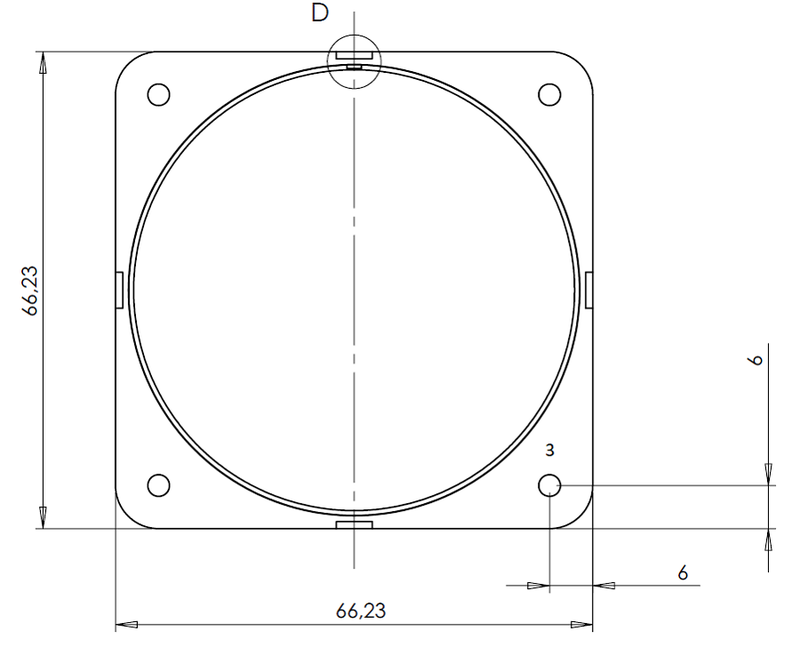 That comes with a waterproof case for the shunt and there is a picture of it on the product page. Im not suggesting you buy the high voltage version because it is very expensive, but you could replicate the same mount for the shunt. Q: Shunt will be in engine room does it need to be covered? A: The circuit board on the shunt is exposed and it is recommended that it be protected from accidental damage, the Blue Sea 2719 works well for this. Its not a waterproof cover but it does protect from accidental knocks. Q: I have solar charging and a battery charger, can this work with two charging sources? Do I just put them both on the shunt terminal with the load? A: The shunt has an exposed circuit board so I recommed that if it is installed in an exposed location that it be covered. We suggest using the Blue Sea 2719 but please note this is not a waterproof cover. Q: Can this be used with a battery disconnect switch? If so, how should it be wired? A: The shunt has an exposed circuit board so if it will be located in an area where it might knocked, or worse still wet, it should have a cover. A: Yes, that will work just fine. Just make sure you locate the shunt on the main negative connection to the entire bank. Q: Can this be used on a 24VDC system where 2 each 12DC batteries is connected in series? A: The shunt has a circuit board screwed to the side of it into which the RJ12 data cable plugs in. Its a bit fragile and if it is at all possible that it might get knocked I would recommend that you cover it up to protect it. A: The cord that comes with it is 10 metres. The absolute maximum is 60 meters, but I would advise something shorter, 50 or so. For longer cables you would have to make up your own, the connections at either end are the same as a standard phone cord. Q: What is the warranty on the BMV700? A: Like all Victron products, with the exception of batteries, this product has a five year manufacturers warranty. A: You can connect it to a computer using the VE Direct to USB connector sold for the purpose. All the software is open source so you can write your own programs to interface with this or use the basic one that they provide. 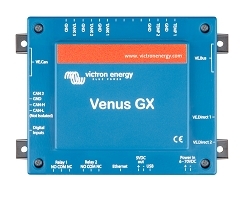 You can also connect it to a Color Control GX or Venus GX and then to the internet for remote monitoring using the Victron VRM, a free service. Look on the Victron website under Downloads>Software for more details. Q: My RV is a 12V system. I will be installing 4ea6 volt batteries wired in series/parallel. will the BMV700 work with this system? Thank you. A: Yes it will work in a series parallel system. The shunt must be placed in the line to the negative other than the other batteries in the bank nothing else can connect on the battery side of the shunt. Q: Can the shunt be mounted in an open battery box where it will be exposed to water, high temps, humidity, and vapor from lead acid batteries? A: The shunt is not waterproof and it and its circuit board will corrode if exposed to battery acid, so the answer here is no. A: Yes it will work with any number of charge sources as long as you wire them all to go through the shunt which then connects to the battery negative terminal. A: You can use it with a battery disconnect switch but the meter needs to be always powered up so the voltage sense wire should either be directly on the battery or on the hot side of the switch. 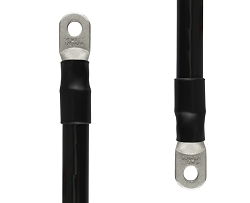 A: The BMV meters all come with a 500 Amp shunt which is good for most applications including yours. Q: What input range will the Victron 700 series accept to power it? I read somewhere 48v max but cannot confirm this anywhere. Q: I have a boat which we use Lithium batteries, and I was wondering if we could use this monitor for the bow mount motor which is 24 vdc, but they are lithium? Thank You. A: Yes it works for Lithium batteries, including 24 volt ones. You will need to tweak the settings because these batteries are so much more efficient that conventional batteries. I have written a Blog post about using Victron equipment with non-Victron Lithium Batteries and you will get some suggestions there as to how to tweak the settings. You will find it under the Lithium Battery section of my blog or there is also a link to it in my "Technical Pages" section. Temperature (0 - 50°C or 30 - 120°F) N.A. We sell a pre-made battery cable assembly to go between the shunt of this amp hour meter and the battery. This cable should be the only connection to the battery negative. We also sell custom cables in other sizes and lengths. Read a great review from one user who installed his BMV meter in a camper van.